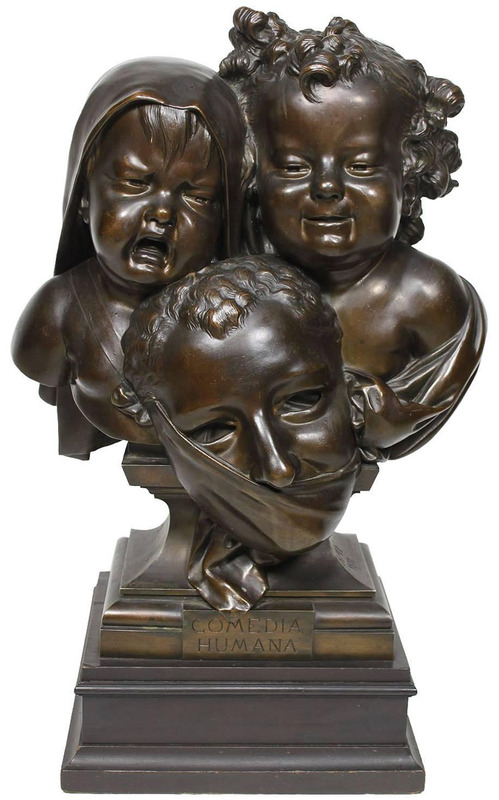 Jean Barnabé Amy (French, 1839-1907) A Fine French 19th Century Dark-Brown Patinated Bronze Group Titled "Comedia Humana" (Human Comedy - Comedie Humaine) depicting a group of two young children, one smiling and the other one crying, in front of the a mask from the performing arts mask known for the theater work of European avant-garde artists from the turn of the nineteenth century. Raised on a wooden plinth. Signed and Dated: Amy, 1877. Comedia Humana (Known as Honoré de Balzac's The Human Comedy or La Comédie Humaine) is a vast series of some 90 novels and novellas by Honoré de Balzac, known in the original French as La Comédie humaine. The books that made up the series were published between 1829 and 1847. Balzac’s plan to produce a unified series of books that would comprehend the whole of contemporary society was not clearly formulated until about 1834, although he had issued several volumes by that time. He elaborated three general categories of novels: Études analytiques (“Analytic Studies”), dealing with the principles governing human life and society; Études philosophiques (“Philosophical Studies”), revealing the causes determining human action; and Études de moeurs (“Studies of Manners”), showing the effects of those causes, and themselves to be divided into six kinds of scènes—private, provincial, Parisian, political, military, and country life. The entire project resulted in a total of 12 volumes published between 1834 and 1837. By 1837 Balzac had written much more, and by 1840 he had hit upon the comprehensive title La Comédie humaine. He negotiated with a consortium of publishers for an edition under this name, 17 volumes of which appeared between 1842 and 1848, including a famous foreword written in 1842. A “definitive edition,” including many new works, was published, in 24 volumes, between 1869 and 1876. Jean Barnabé Amy (French, 1839-1907) A Fine French 19th Century Dark-Brown Patinated Bronze Group Titled "Comedia Humana" (Human Comedy - Comedie Humaine) depicting a group of two young children, one smiling and the other one crying, in front of the a mask from the performing arts mask known for the theater work of European avant-garde artists from the turn of the nineteenth century. Raised on a wooden plinth. Signed and Dated: Amy, 1877. Comedia Humana (Known as Honoré de Balzac's The Human Comedy or La Comédie Humaine) is a vast series of some 90 novels and novellas by Honoré de Balzac, known in the original French as La Comédie humaine. The books that made up the series were published between 1829 and 1847. Balzac’s plan to produce a unified series of books that would comprehend the whole of contemporary society was not clearly formulated until about 1834, although he had issued several volumes by that time. He elaborated three general categories of novels: Études analytiques (“Analytic Studies”), dealing with the principles governing human life and society; Études philosophiques (“Philosophical Studies”), revealing the causes determining human action; and Études de moeurs (“Studies of Manners”), showing the effects of those causes, and themselves to be divided into six kinds of scènes—private, provincial, Parisian, political, military, and country life. The entire project resulted in a total of 12 volumes published between 1834 and 1837. By 1837 Balzac had written much more, and by 1840 he had hit upon the comprehensive title La Comédie humaine. He negotiated with a consortium of publishers for an edition under this name, 17 volumes of which appeared between 1842 and 1848, including a famous foreword written in 1842. 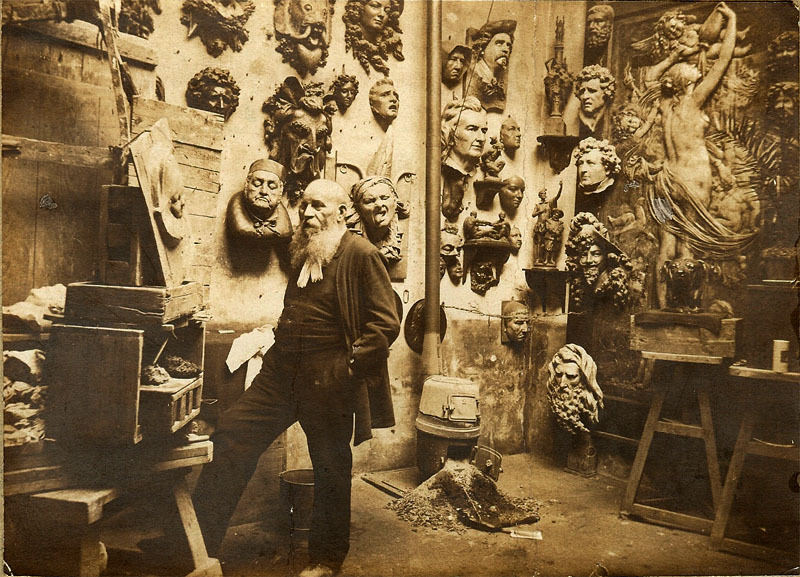 A “definitive edition,” including many new works, was published, in 24 volumes, between 1869 and 1876.